Anyone who loves to bake is just going to fall in love with the KitchenAid Artisan Stand Mixer for a whole lot of reasons – the look – the performance and of course, the price. It’s a little piece of heaven in your kitchen. The fact is, the KitchenAid Artisan 5-Quart Stand Mixer is gorgeous to look at. I absolutely love mine. This is not an item that you will put into a cupboard and forget. Mine sits out on my kitchen counter even though I don't have a lot of space. Even if you don’t think you’ll use it (which you will!) it’s worth buying just because it looks so fabulous! And with 26 colors to choose from, you are spoilt for choice! You can probably tell already that we really like the Kitchenaid Artisan 5qt Stand Mixer...but then what's not to like? This is one of those must haves in the kitchen...at least for those that do a lot of baking. The mixer stands 15 inches high and is a foot across. Don’t even begin to measure up cupboard space for it. You’ll want to use it all the time and when you’re not using it, you’ll be gazing happily at it…trust me! Just clear a prominent area of counter top (near a power source) and fall in love. But apart from wanting to keep it out on the counter to gaze lovingly at it, let's be practical for a minute...at over 20 pounds, you really aren't going to want to be lifting this baby in and out of the kitchen cabinet every time you need to use it. This mixer looks sturdy and it is. 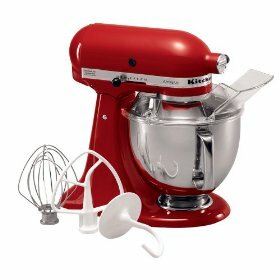 It has 325 watts of power so that it’s easy to cream butter, knead dough or whip cream. All you have to do is pour the ingredients into the deep bowl, tilt the top of the machine so that the paddles go into the bowl, turn it on and let it do its’ stuff. 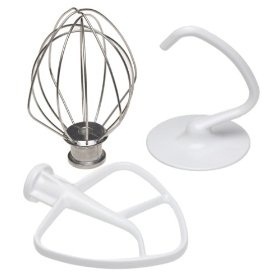 The Artisan Kitchenaid Stand Mixer comes with three attachments. There’s a flat beater for making batter or a much stiffer meat loaf mix…and any texture in between those two. A wire whip makes short work of fluffing up egg whites, mayonnaise, angel food cake or anything that needs a good airing. Last but not least, a dough hook will have you making your own delicious bread. It mixes and kneads the dough for you. You get the tantalizing smell and wonderful taste of fresh, homemade bread (and the compliments!) without the grunt work! All of the attachments are strongly built and are easy to insert into the beater shaft with one twist. The Artisan comes with a 5 quart stainless steel mixing bowl. It has an ergonomic handle which is specially contoured to fit your hand comfortably. This means that you can lift the bowl easily and safely without painfully straining your wrist, – even when it’s full of heavy mixture. As the shaft spins counter clockwise, the beaters spin clockwise. This moves the beaters to an amazing 67 points of the bowl. We found that it works extremely well at ensuring all of the ingredients are blended and we didn't have to keep turning the bowl around or scrape down the sides. However, there have been some complaints about the inability of the beaters to reach the entire bowl resulting in the need to constantly scrape down the bowl to ensure that everything is mixed evenly. However, this can be remedied by simply adjusting a screw under the motor head. This also works if the flat beater hits the bottom of the bowl. The manual that comes with your Artisan Stand Mixer provides step-by-step instructions on how to do this. The Kitchenaid Artisan Stand Mixer offers 10 speeds. There is a slow stir option, going right up to a very high speed, so you can control the mixing process required for your recipe. The speeds are chosen by the simple movement of a large knob. Stir - used for stirring, combing, mashing and starting all mixing procedures. 2 - used for slow mixing, mashing, faster stirring. Used for preparing yeast doughs. 3 - used for mixing and beating semi heavy batters. 6 - used for beating and creaming or whipping. 8 - used for fast beating and whipping cream, egg whites and boiled frostings. 10 - used for fast whipping small amounts of cream or egg whites. Speeds 3, 5, 7 and 9 can be used for finer control. The mixer comes with a clear, 2 piece pouring shield which fits snugly around the rim of the mixing bowl to stop ingredients from flying out when the Artisan is hard at work. A chute makes it easy to add ingredients to the mix without spills. Because the mixer head tilts right back, it’s easy to gain access to both the bowl and the beaters. The mixer head is held securely in place by a locking lever and the bowl locks in place on the base to avoid rocking while mixing, or knocking it over when tilting the head back to insert or remove the beaters. Yes and no. The bowl, flat beater and the dough hook can be washed in the dishwasher. Anything else needs to be hand washed. We found that Amazon consistently has the best price. 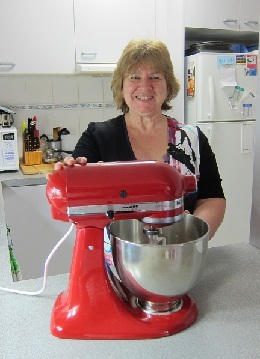 What more can we say about the KitchenAid KSM150PSWH Artisan Stand Mixer? This is definitely one for the Xmas or Birthday list…if you can wait that long! 1. 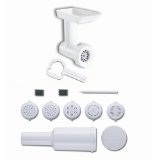 Basic Kit – pasta roller, fettuccine cutter, lasagne sheet and linguine cutters. 2. Advanced Kit – lasagne, spaghetti, fettuccini, thick egg noodles, angel hair pasta and ravioli. A 2 quart bowl attachment that will allow you to make your favorite ice cream, sorbet, granita……in only 15 to 20 minutes. Grind meat, nuts and coffee, slice vegetables, fruits and cheeses and shred cabbage, potatoes and yet more cheese. You can also use this tool to make flavored and apple butter. 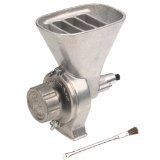 This can be used to turn any non-oily grain or seed into flour. This is perfect for you if you have an issue with wheat and find gluten-free breads expensive. It’s much less expensive to grind your own non-wheat flour. Those are just the most popular attachments. There are also citrus juicers, sausage stuffers and lots of other great gadgets for you which you can buy from Amazon … and don’t miss the KitchenAid Stand Mixer Cloth Cover – although it seems a shame to cover up such a work of art!